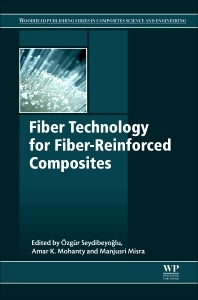 Fiber Technology for Fiber-Reinforced Composites provides a detailed introduction to fiber reinforced composites, explaining the mechanics of fiber reinforced composites, along with information on the various fiber types, including manufacturing of fibers (starting from monomers and precursors), fiber spinning techniques, testing of fibers, and surface modification of fibers. As material technologies develop, composite materials are becoming more and more important in transportation, construction, electronics, sporting goods, the defense industry, and other areas of research. Many engineers working in industry and academics at universities are trying to manufacture composite materials using a limited number of fiber types with almost no information on fiber technology, fiber morphology, fiber properties, and fiber sizing agents. This book fills that gap in knowledge. highlighted projects are “basalt-carbon intraply hybrid woven cloth based composites”, “TPU and Woven Cloth Based Health, Security Boots”, “Natural Fiber Composites for Automotive Applications”, “Biofiber Composites for Antimicrobial Polymers”, “Graphene Enhanced Carbon Fiber Composites”, “Hybrid Nanocomposites for Flame Retardancy”. Dr. Amar K Mohanty is a Full Professor and Premier’s Research Chair in Biomaterials and Transportation is the Director of Bioproducts Discovery & Development Centre at University of Guelph, Ontario, Canada. He is an international leader in the field of bioplastics, biobased materials and advanced biorefining with a focus in engineering new sustainable materials. He has more than 500 publications to his credit including 260 peer-reviewed journal papers, 25 patents (granted/filed), several conference presentation, 15 book chapters and three edited books. He was the chief editor of the CRC Press volume, “Natural Fibers, Biopolymers and Biocomposites,” Taylor & Francis Group, Boca Raton, FL (2005) and the American Scientific Publishers volume “Packaging Nanotechnology”, Valencia, California, (2009). Dr. Manju Misra is a professor in the School of Engineering and holds a joint appointment in the Dept. of Plant Agriculture at the University of Guelph. Dr. Misra’s current research focuses primarily on novel bio-based composites and nanocomposites from agricultural and forestry resources for the sustainable bio-economy targeting the development of bio-based and eco-friendly alternatives to the existing petroleum-based products. She has authored more than 380 publications, including 250+ peer-reviewed journal papers, 24 book chapters, and 15 granted patents. She was an editor of the CRC Press volume, “Natural Fibers, Biopolymers and Biocomposites,” Taylor & Francis Group, Boca Raton, FL (2005); American Scientific Publishers volume “Packaging Nanotechnology”, Valencia, California, (2009) and “Polymer Nanocomposites”, Springer (2014).